Moving your office or place of business in search of better opportunities and more customer exposure is something normal in today’s dynamic market environment. Moving offices however is a complex, high responsibility process which is best handled by qualified professionals such as us at Movers London Co Ltd. Relocating your place of business should be a swift, cost effective exercise which doesn’t leave your company budget in tatters, and know how to make it happen just right. In our industry experience as a professional moving company we have gathered invaluable expertise and knowledge on how to make office relocations quick, manageable and affordable for our customers and their staff. Our specialised London office removal service will give you the desired peace of mind and reliability which means you get to run your business effectively for the time being while we deal with the removal from start to end. Not having to make your employees pack or load/unload the vans. Full licensing and insurance liability provided by Movers London Co Ltd. In many cases, ill prepared office removals can be quite disastrous as one such situation translates to excessive business downtime and a ton of lost profits, not to mention incurring expenses for failing to vacate the premises timely. When you have us dealing with your office removal, none of the above will be a problem as we will take the time and effort to plan, organise, execute and complete timely and accordingly every stage of the process, just as expected of true professionals. We offer our commercial customers fully comprehensive, yet budget minded office removal solutions which work with their availability and financial requirements. We will begin the relocation prep work well ahead of the actual moving date, or whenever suits you. If necessary, under your guidance, our logistics experts will compile a full inventory of items and equipment to be moved from the office. Should you need to move the contents of multiple or identical office spaces we will list and label the contents of each office and make sure nothing is misplaced or mixed up along the way. In case you have any additional concerns or require further clarification about the service and the way we do things, please feel free to consult with us at any stage of the relocation process – we will be happy to oblige and explain in detail. When using our professional office removal services in London, you can rely on us to take special care and attention when shifting expensive office equipment as well as valuable office furniture, which in many cases is custom made. Packing, wrapping and securing of your office contents will be done with utmost care and precision so that damage during transit is avoided in all instances. We will also take necessary measures to protect the premises you are moving out of, from damage such as dents, scratches and scuffmarks to walls, corners and woodwork. This will save you a ton of unnecessary landlord hassles on your way out, and make the entire process more affordable. Our trained and experienced veteran movers in London have been handling business relocations in the capital for many years now. They know what is expected from them and what the best course of action in every situation would be. Instead of stressing over a certain detail of your project, just give us a call for a discussion and tons of useful advice. We want you to know that we are the people to trust in every situation, for anything. 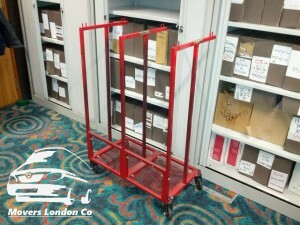 We know how to do office removals in London properly, so why bother taking it upon yourself to finish the job? Timing is crucial, especially when it comes to full scale office removals. We are well aware of this, and will schedule your office removal for a suitable off-peak time – either out of business hours, or over the weekend so that everything is wrapped up and ready to go with the least amount of disruption to your daily schedule and staff duties. Our office removal service available in London will also cover unpacking and distribution of items over at your new address. We will make sure that you are settled and ready for business as soon as possible after arrival at your new office location. The London based office removal service we offer you, is available throughout the year including on public holidays and long weekends. London is one of the most economically important cities in the world. The City is where most of the big financial establishments are based, but in recent years Canary Wharf distinguishes itself as a commercial power in its own right. Tourism and culture are other major sources of income for the London economy.